CYCLING enthusiasts have started a petition for a trail in a nature reserve to be reopened for mountain biking, but nature lovers oppose the move. The trail in question is the Butterfly trail in the Central Catchment Nature Reserve, which was closed by the National Parks Board (NParks) in March, as parts of it fall within the construction site of the upcoming Chestnut Nature Park. Mountain bikers have lamented the loss of this trail, famous for its terrain of interlocking tree roots and views of Upper Peirce Reservoir. Yesterday, the Mountain Bike Association Singapore started a petition to the Government to reopen the site. Its president, Mr Calvin Chin, said that the 1,000-strong association hopes to get 5,000 signatures and will write to the authorities "within the next couple of weeks". But environmentalists hope the trail stays closed to all human activities, including mountain biking, hiking and running, as these have damaged the century-old nature area off Chestnut Avenue. On a site visit with NParks and the Nature Society (Singapore), or NSS, last Friday, The Straits Times saw that the roots of trees along the man-made trail were exposed, and the nutrient-rich leaf litter and topsoil layers were eroded. "These issues result in the destruction of seedlings, as well as the loss of mature vegetation immediately adjacent to the trails," said Mr Tony O'Dempsey, chairman of the NSS' plant group, in a forum letter to The Straits Times on May 21. But Mr Chin said bikers who use the trail are environmentally conscious. "We tell our members not to litter, and we do not veer off the tracks," he said, adding that a member paid about $500 last year for restoration works on the trail. Cyclists can now go mountain biking at only four other areas - Bukit Timah, Mandai, Kent Ridge and Pulau Ubin. 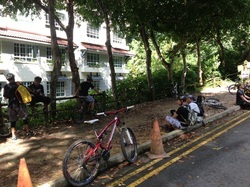 Until recently, mountain biking was not allowed at the Butterfly trail, with riders risking fines from NParks. In 2012, the mountain bike association lobbied for the trail to be opened for recreational use and sent the parks board a study on the use of the Butterfly trail for mountain biking. NParks decided to allow cyclists to use the 3.2km trail until the building of new biking trails at the new Chestnut Nature Park began early this year. Asked to comment on the report sent by the association, NParks told The Straits Times that the paper might have touched briefly on the environmental impact on the forest trails, but it cannot be considered an environmental impact assessment. Such an assessment is considered more rigorous. It noted that the paper "did not make a comprehensive assessment of the current biodiversity found there nor a thorough assessment of the impact on the area should mountain biking be allowed to continue". Studies done by NParks and NSS between 2013 and this year found a number of rare and endangered flora and fauna in the Butterfly trail site, including the Malayan porcupine and Hopea and Shorea trees. This was contrary to the association's study, which found no endangered species there. Said NParks: "We are considering the possibility of closing the trail permanently. However, no decision has been taken yet and we will make another assessment of the area in 2016 before deciding." 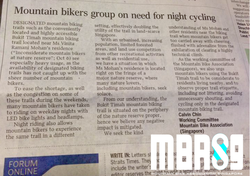 The Straits Times understands that the mountain bike association and the NSS are meeting to exchange views tomorrow. Said Mr O'Dempsey: "We are not picking on the mountain biking community. Our opposition to the use of the Butterfly trail is consistent with our overall policy on the conservation of native habitats in the nature reserve - areas for the conservation of native flora and fauna. This applies to mountain bikers, hikers, runners and, especially, ourselves." The association has released an action plan for members to help save access to Butterfly trail. Details here. 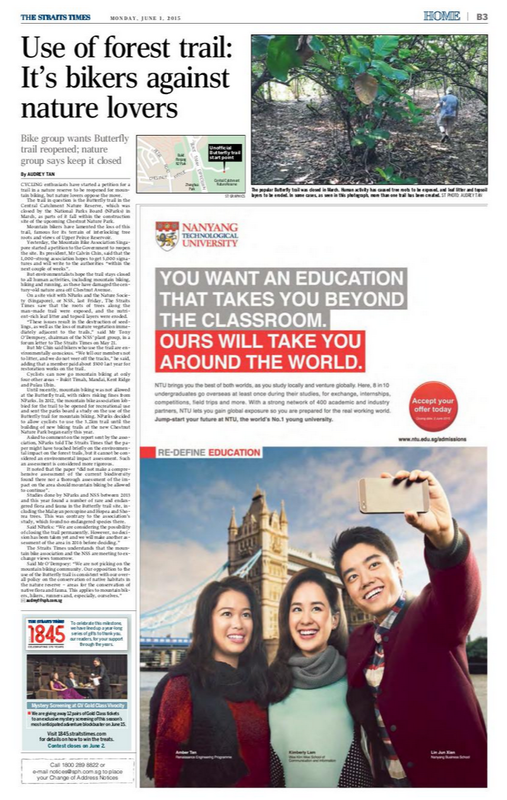 Butterfly trail has been appearing on the Straits Times, with a report in the Home section and letters to the Straits Times Forum by the Nature Society (Singapore) and mountain bikers. Here are the details. Acknowledgement and thanks to the Straits Times for drawing attention to our cause. 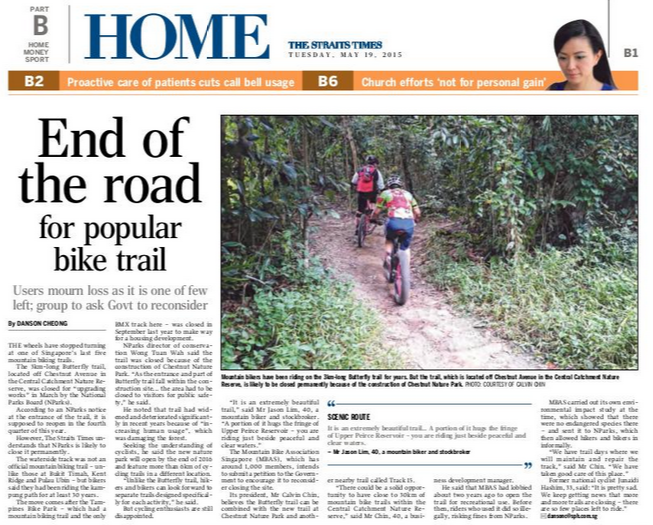 THE wheels have stopped turning at one of Singapore's last five mountain biking trails. 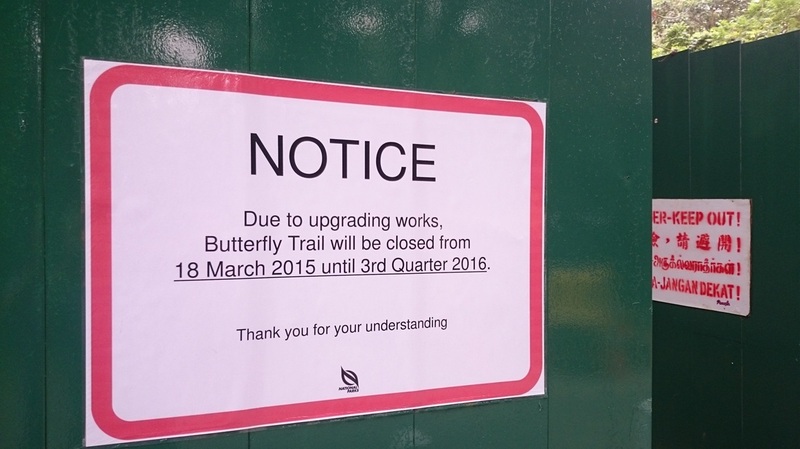 The 3km-long Butterfly trail, located off Chestnut Avenue in the Central Catchment Nature Reserve, was closed for "upgrading works" in March by the National Parks Board (NParks). According to an NParks notice at the entrance of the trail, it is supposed to reopen in the fourth quarter of this year. 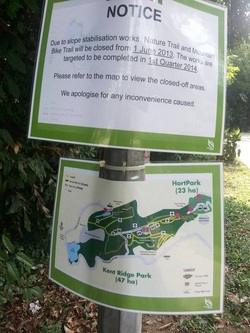 However, The Straits Times understands that NParks is likely to close it permanently.The waterside track was not an official mountain biking trail - unlike those at Bukit Timah, Kent Ridge and Pulau Ubin - but bikers said they had been riding the kampung path for at least 30 years. The move comes after the Tampines Bike Park - which had a mountain biking trail and the only BMX track here - was closed in September last year to make way for a housing development. NParks director of conservation Wong Tuan Wah said the trail was closed because of the construction of Chestnut Nature Park. "As the entrance and part of Butterfly trail fall within the construction site... the area had to be closed to visitors for public safety," he said. He noted that trail had widened and deteriorated significantly in recent years because of "increasing human usage", which was damaging the forest. Seeking the understanding of cyclists, he said the new nature park will open by the end of 2016 and feature more than 6km of cycling trails in a different location. "Unlike the Butterfly trail, hikers and bikers can look forward to separate trails designed specifically for each activity," he said. But cycling enthusiasts are still disappointed. "It is an extremely beautiful trail," said Mr Jason Lim, 40, a mountain biker and stockbroker. "A portion of it hugs the fringe of Upper Peirce Reservoir - you are riding just beside peaceful and clear waters." The Mountain Bike Association Singapore (MBAS), which has around 1,000 members, intends to submit a petition to the Government to encourage it to reconsider closing the site. Its president, Mr Calvin Chin, believes the Butterfly trail can be combined with the new trail at Chestnut Nature Park and another nearby trail called Track 15. "There could be a solid opportunity to have close to 30km of mountain bike trails within the Central Catchment Nature Reserve," said Mr Chin, 40, a business development manager. He said that MBAS had lobbied about two years ago to open the trail for recreational use. Before then, riders who used it did so illegally, risking fines from NParks. MBAS carried out its own environmental impact study at the time, which showed that there were no endangered species there - and sent it to NParks, which then allowed hikers and bikers in informally. "We have trail days where we will maintain and repair the track," said Mr Chin. "We have taken good care of this place." Former national cyclist Junaidi Hashim, 33, said: "It is pretty sad. We keep getting news that more and more trails are closing - there are so few places left to ride." THE Butterfly trail, off Chestnut Avenue in the Central Catchment Nature Reserve, has never been a public access trail, though we are aware that people have been using it illegally for some time ("End of the road for popular bike trail"; Tuesday). Surveys conducted by the Nature Society's Vertebrate Study Group and Plant Group members have revealed that contrary to the environmental impact study the Mountain Bike Association Singapore said it conducted, the area not only harbours nationally endangered species of flora and fauna, but it is also becoming significantly degraded due to excessive bike and foot traffic. Degradation includes impacts such as trail widening, compaction, erosion, root exposure, litter and fire damage. These issues result in the destruction of seedlings, as well as the loss of mature vegetation immediately adjacent to the trails. Diversions created to bypass fallen trees result in further damage and losses. Many of these trees have already suffered damage from trail users due to root damage, trail widening and hacking. In terms of fauna, a number of nationally endangered mammals have been identified in the area, including the lesser mousedeer, Malayan porcupine, Sunda pangolin, and shrew-faced ground squirrel. Most forest mammals are extremely shy, and the presence of human traffic will drive them away from the trails. Considering the richness of the flora and fauna in this unique patch of forest, the National Parks Board is fully justified on ecological grounds to limit public access to this and other sensitive areas, and it has the full support of Nature Society (Singapore) in doing so. We also note that the substantial mountain-bike facilities planned for the adjoining Chestnut Nature Park, along with separated hiking trails, will represent an increase in the amount of trails available for these purposes. THE closure of the Butterfly Trail is a great loss to the local mountain biking community ("End of the road for popular bike trail"; last Tuesday) and it is no surprise why: The trail gave bikers arguably the most authentic mountain biking experience locally, with its scenic natural views and challenging technical terrain. While these intangible benefits are unlikely to incentivise the authorities to reconsider the closure, there are more worrying tangible consequences that I hope the authorities have taken due appreciation of. First, with the gradual disappearance of biking trails - starting with the Tampines Bike Trail last year - the few remaining trails have had to take on an increased load of cyclists, which may not be sustainable in the long run. Second, local businesses involved in mountain biking, from equipment distribution to servicing, will take a hit, as fewer trails would mean more cyclists giving up, and possibly fewer people adopting the sport due to less accessibility and fewer avenues to practise the sport. Lastly, mountain biking is a unique sport that transcends race, nationality and social class. From my observation, there is a significant number of expatriates who hit the trails, as mountain biking is widely popular in Western countries, and the trails here serve as an excellent platform for locals and foreigners to mingle. While it is understandable that the Butterfly Trail had to be closed due to its deterioration, with these factors in mind, I hope the authorities will pay more attention to this niche sport and actively seek to open up more viable natural spaces for mountain biking to flourish. The Bt TImah Mountain Bike Trail , which is located on the peripheral of the Bt Timah Nature Reserve, is not affected by the closure of hiking trails announced by Nparks. This has been clarified by Nparks in response to MBASG's query on the matter. With hiking trails in BT closed, mountain bikers can expect an increase in the number of hikers and runners who will encroach upon the MTB trails. We know of many near-misses, and this potential increase in unauthorized trail usage by hikers will lead to more of such incidents. We will engage with Nparks to see how we may best address this issue proactively. In order to provide numbers and statistics of near-misses, we will also be looking at setting up a near-miss reporting link or email where mountain bikers can provide data with details, which can then be shared with Nparks so that they can be aware of how serious the issue is. Please note that the Kent Ridge Mountain Biking trail will be closed temporarily from June 1, 2013 for slope stabilization works. MBASG has asked for a reroute to be considered so that the entire trail does not need to be closed off. This will be reviewed next Tuesday, June 4 by Nparks with our technical advisor HM Lim. Until further notice, Mountain bikers and Association members are urged to refrain from riding the trail for safety reasons. Meet MBASG as we hold a trail update townhall at Zhenghua Park meeting point 3, Chestnut Ave at 0830 on Sat May 18. There will be a quick update on local trail matters, and developments within MBASG. See you there! A much needed update posted. MBASG has been working in the background, and the committee has been meeting on a monthly basis since the start of the year. A Pro-Tem committee has been formed to take MBASG forward. MBASG had a meeting on 3 November 12 to update Nparks on the updates of BT2.0 as well as seeing what changes will be made to BT in 2012. The report summary can be found here. Since the publication of our reply on the ST we have had over 400 hits on this site. Have a comment about our reply? Please feel free to contact us at webmaster@mbasg.org. Alternatively do drop us a reply under the contact us section. We work for the improvement of trails in Singapore for all mountain bikers. Calvin Chin of the MBASG has got our reply to the straits times. The article can be found here. 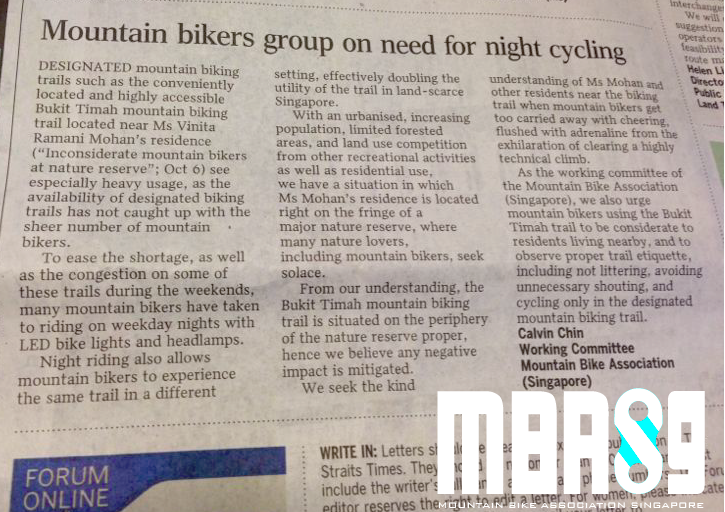 We are currently working as a voice for mountain bikers in Singapore. For updates please check back on this site or visit our facebook. Pictures wanted. MBASG is looking for contributions for riders having fun on the trails or photographers with photographs to contribute! Due recognition will be given for the photographs contributed to our site. Please do email us at webmaster@mbasg.org if you have pictures to contribute. Thank you in advance. MBASG congratulates Singaporean Rider Tan Hong Chun for clinching the 1st Runner up in the Asian MTB Championships in Lebanon. Trail guide section has been updated. For riders who are unfamiliar with the trail this would be helpful. In addition we have also uploaded our response for a letter dated 6 October to the Straits Times. The reply can be found here. Reply to Ms Vinita Ramani Mohan. MBASG.org is now live. We look forward to update the mountain biking community with the latest happenings regarding trail usage and advocacy! Meanwhile please feel free to browse the site. These are all still works in progress.